A local group has “welcomed with delight” the announcement yesterday, Wednesday, of funding for the preservation of the Spanish Armada wrecks site at Streedagh. FROM THE DEEP: One of two cannon guns from the Armada shipwrecks emerges from the water in Streedagh for the first time since the sinking of La Juiliana in 1588. “This development is something that we have being working towards for the past five years,” said Eddie O’Gorman, Chairman of Grange and Armada Development Association (GADA). He was speaking in the wake of the recovery from the sea near Streedagh beach of cannons from the wreck of one of three Armada ships, which foundered off there in 1588. 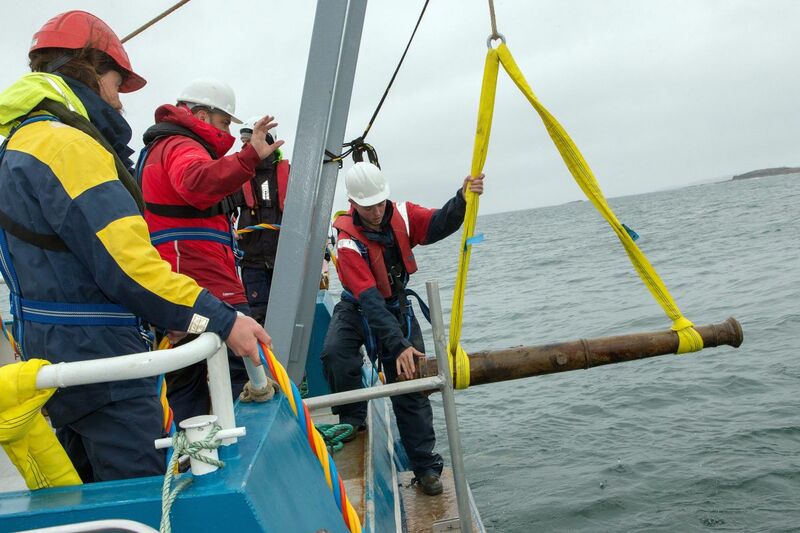 Yesterday morning Minister for Arts Heritage and The Gaeltacht, Heather Humphreys visited the dive site where members of her Department’s Underwater Archaeology Unit are securing and recovering material from the remains of a ship called La Juliana. It is believed the material became exposed as a result of storms over the last two years. The items found include a number of cannons, which are described as being in excellent condition. One cannon bears the date 1570, the year La Juliana was constructed. The recovery operation is expected to last a number of weeks. Minister Humphreys announced that recovered material will be conserved by the National Museum of Ireland. “My Department first became aware that some new material from the Armada wrecks may have been uncovered in April of this year, following reports from the local community and the Grange Armada Development Association that large numbers of ships timbers were being washed ashore. Since April, my Department has put an action plan in place to carry out dive surveys and safeguard the site”, the minister said. “We have uncovered a wealth of fascinating and highly significant material, which is more than 425 years old.” She said that on current evidence, the other two wreck sites (of the La Lavia and Santa Maria de Vision) remain buried beneath a protective layer of sand. Meanwhile, Eddie Gorman said recent survey findings have revealed the vulnerability of the Armada wrecks at Streedagh and GADA is determined to assist and support the State authorities in the recovery and preservation of precious artefacts contained in the endangered wrecks. “We are appealing for funding for a number of developments which will enhance this unique tourist resource and attract international visitors to the north Sligo region. “The first step is the urgent upgrade of the old courthouse at Grange to provide a state of the art Armada Interpretive and Visitor Centre which will act as a focal point for the work on the Streedagh Wreck site,” said Mr O’Gorman. The group also feels the development of a secure holding facility in Grange to house the necessary ancillary vessels and equipment is of vital importance.